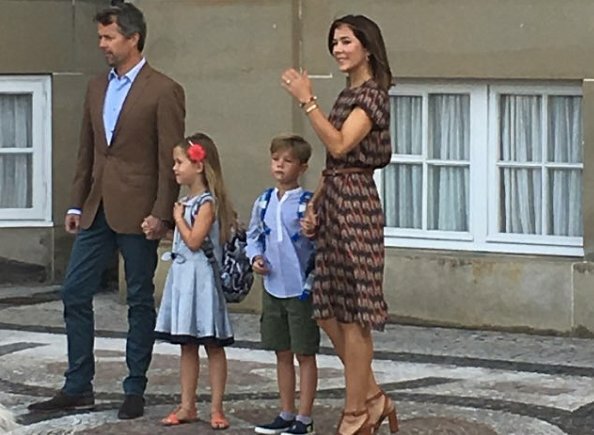 Crown Prince Frederik and Crown Princess Mary's youngest children, Prince Vincent and Princess Josephine started in Grade 0 at Tranegård School in Hellerup. 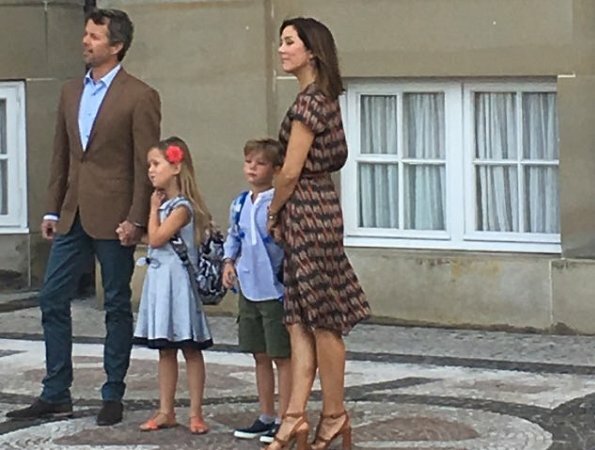 In this connection, Crown Prince Frederik, Crown Princess Mary, Prince Vincent and Princess Josephine posed for the press at the Amalienborg Palace. 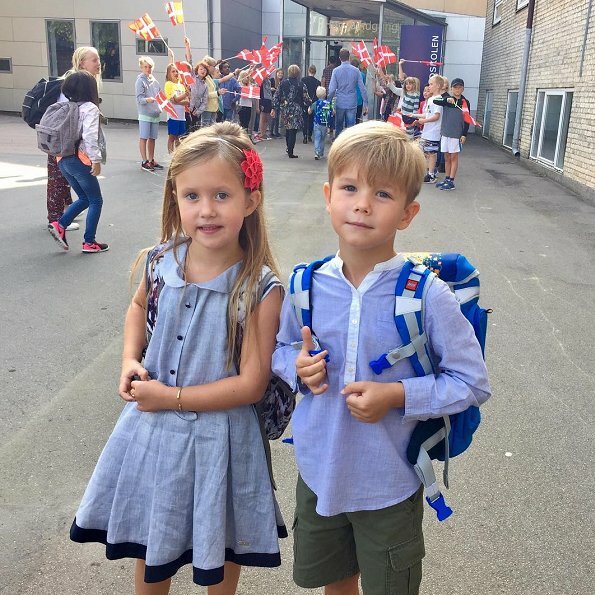 Prince Vincent and Princess Josephine will be the same school as their siblings, Prince Christian and Princess Isabella. Just a little bonus info: The twins are not going in the same class, Frederik and Mary told that they are very close and they wanted them to have each their own friends. All in all, a very well put together family. They all must have put out their clothes last night! An analysis from A to Z can be said ...... but I find Mary's dress is in autumn colours! :-) But her dress isn't so important, it's Josephine and Vincent's day, lovely children, and it's a wise choice that they shouldn't go in the same class. And Frederik and Joachim didn't do that even though they started school at the same time. Josephine, how she is flirting with the camera yet, so cute. Vincent will be a stunner, of that I am sure. Good thing, that they will be in different classes, so they can make friends for life. CP Marys dress is easy going & appropriate. I love the belt & shoes. CP Frederik looks good too. I have a twin sister and we were never in the same classes at school either. It's always nice to have a little independence from each other. I agree that Vincent is going to grow up to be a very handsome man but the poor thing looks very emotional today. (And Mary too in the solo pic). Their babies are off to school! I think it is harder on the parents than the children. Both the kids look cute. 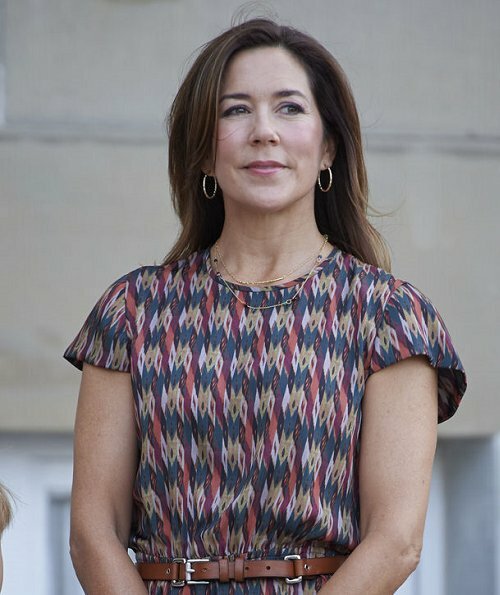 Love Mary's dress and shoes. Poor Vincent - must be difficult to start something new and then have to face the cameras. I'm sure he had fun once he got into class. I can't believe how the game had flown since they were born! Love what they're wearing especially Josephine's cute dress. Mary looks good too. I like Mary's dress, and the children look very cute. Josephine looks Very happy, Vincent not so much. I like that the pictures are very natural not overly posed ones, like other royals.